Alzheimer’s Disease is a degenerative brain disease that causes a slow decline in memory and cognitive abilities. There are over 100 diseases and conditions that can mimic Alzheimer’s, so it is easy to immediately think you or a loved one have developed this incurable scourge. 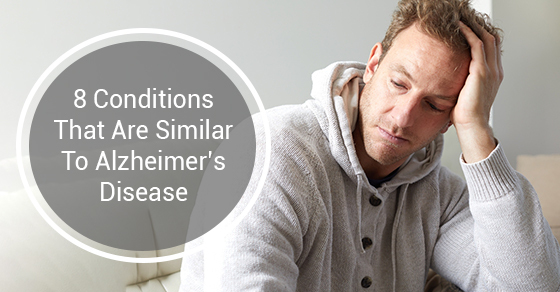 Fortunately, many other conditions that are similar to Alzheimer’s disease are treatable. We will highlight the most common early symptoms of Alzheimer’s and then discuss 8 other conditions that are similar. Memory loss that affects daily life, especially recently learned information. Driving to familiar places may become difficult, or forgetting important dates, or the day of the week. Repetitive questioning is another early symptom. Difficulty solving problems or doing familiar tasks like paying bills and cooking dinner. Many tasks will take longer to do. Problems with words and vocabulary, both spoken and written. Changes in mood and/or personality, like confusion, suspicion, fear, disorientation and anxiety. If you notice any of these symptoms, make an appointment to find out the cause. Be aware that many of these symptoms could be similar to another treatable disease, especially in seniors. Mini-Strokes – Some elderly loved ones could be experiencing mini strokes. Most patients do not even realize they are happening, but the results are similar to Alzheimer’s. Also known as Vascular Dementia, the blood flow in the brain is affected leading to cognitive impairment. This can be treated with cognitive rehabilitation, reducing blood pressure, brain exercises, and medication. Certain medications can cause confusion and other symptoms. As patients age they do not metabolize and eliminate drugs from the body as efficiently as they did when they were younger. Mixing certain meds like antihistamines, antidepressants, sleeping aids, muscle relaxants, and others can mimic the signs of Alzheimer’s. Always tell your doctor what meds you are taking, including those over the counter. Urinary tract infections can look like Alzheimer’s disease, especially in the elder population. Patients can exhibit confusion, sleepiness, lack of focus, and even hallucinations. An exam can diagnose the infection and antibiotics will treat the condition. Lyme Disease is difficult to diagnose, and it can cause similar symptoms. If a senior spends a lot of time outdoors, the bite of a tick could be the culprit. It causes problems with short term memory, and can slow down activity and cognition. Once diagnosed, antibiotics will eliminate all the symptoms. If you have concerns that your loved one is exhibiting any of the symptoms of Alzheimer’s, see a doctor for testing as soon as possible. It could be a simple condition that can be treated. Contact C-Care Health Services for more information on our home care services. I was diagnosed with Parkinson’s disease 3 year ago at the age of 69. For several months I had noticed tremors in my right hand and the shaking of my right foot when sitting, as the disease progressed i totally lost balance. Neurologist had me walk down the hall and said I didn’t swing my right arm. I had never noticed! I was in denial for a while as there is no history in my family. I used amantadine, Carbidopa/levodopa and physical therapy to strenghten muscles all failed. In 2016 a friend suggested Natural Herbal Gardens who have successful herbal treatment for Parkinson’s disease, i read a lot of positive reviews from patients who used the treatment and i immediately started on it. I had great relief with this herbal treatment. I walk very much better now, no case of shortness of tremors or Anxiety since treatment. Visit Natural Herbal Gardens website ww w. naturalherbalgardens. com. This Parkinson’s treatment is a miracle! !